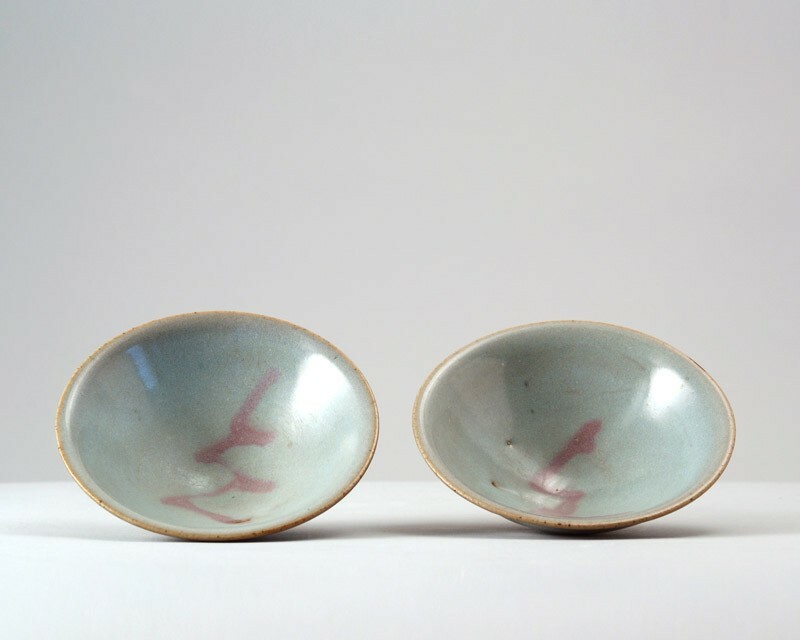 This pair of bowls is unusual in shape and decoration and it is extremely rare that two such vessels, which were obviously made together, have survived together, especially since the concept of ‘pairs’ was not yet properly developed at the time. The bowls have slightly convex, conical sides which flare very slightly towards the rim, the splayed foot is neatly cut and the base somewhat pointed. The opaque, light blue glaze fades to a translucent mushroom colour at the rim and ends well above the foot in an uneven line. Both bowls are decorated on the inside with a zigzag line in a soft pinkish purple. The base and surrounding areas are unglazed and have fired a dark reddish brown, and both bowls have an accidentally unglazed brown-burnt spot inside.